What will you do when your children graduate from college? 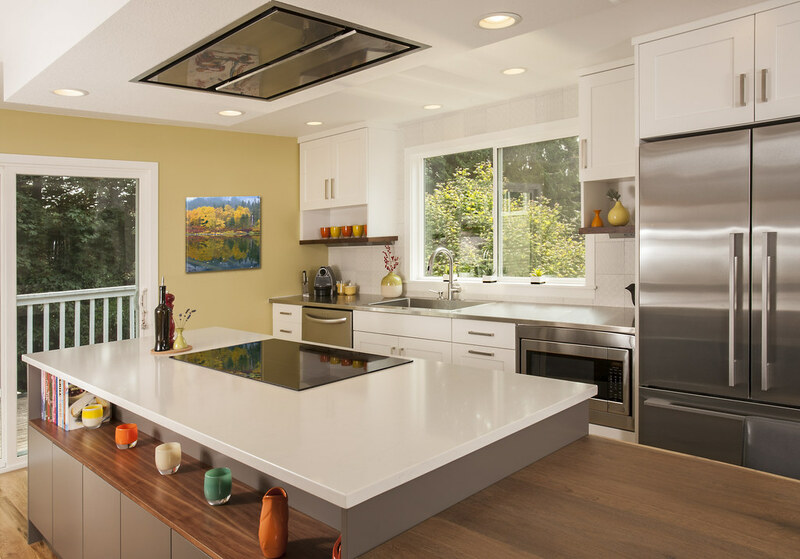 For this Kirkland, Washington couple, the answer was simple: make your dream kitchen into a reality. The existing kitchen in this 1984 home felt tight, cramped and disconnected from the open plan of the living and dining area. It was also dark and had little room for our designers to work with the clients, let alone space for family or friends when entertaining. The kitchen may have been where the couple cooked for their children when they were younger, but it was long overdue for an update. “We got the very most from the space as far as function and aesthetics,” says Diane Foreman, Neil Kelly design consultant. Because both clients loved to cook, making sure the remodel opened up the space to allow them to finally work together was also a priority. Along with opening up the space, the clients requested improved ventilation, increased counter space and open shelves and storage for their cookbook collection. To start, the Neil Kelly team installed a pantry and broom closet to increase storage, while maintaining a 36” aisle in the area outside the work triangle between the refrigerator, sink and stove top. This prevented encroachment on the existing sliding door location. Part of the creative process in any redesign is finding solutions that work within both the space and the budget. In order to increase the ventilation while keeping the space open and inviting, the team got creative. 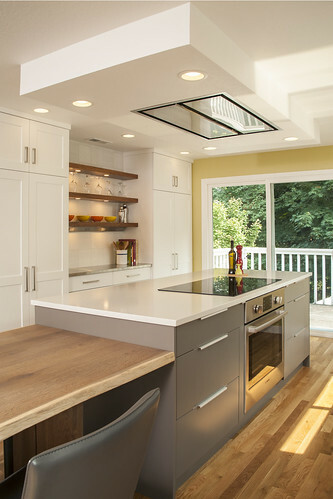 The perimeter ventilation was installed in a custom soffit above the cooktop, providing state of the art ventilation at a comfortable height (and price) for both clients. 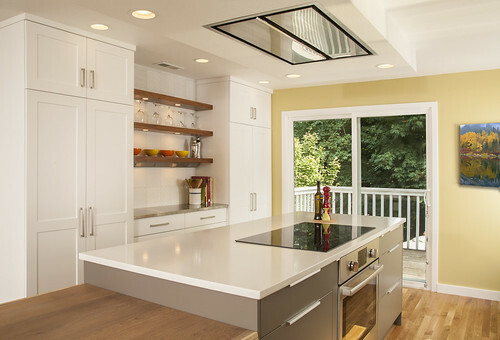 The expanded island also includes a new induction cooktop and a single oven flanked by filler pull outs for herbs and spices. 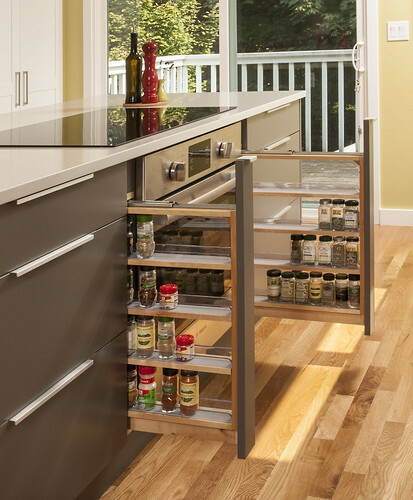 An open shelf for cookbooks runs the length of the island with plenty of storage cabinets for pots and pans below. A free-standing dining table with a rustic finish provides additional workspace, a comfortable dining experience and a place for guests to sit while the clients entertain. An accent element like this is crucial when working with a light, soothing color palette. “If you’re using greys and whites, you run the risk of it becoming a little boring unless you have contrast. By bringing in the natural wood and the rustic character of the table and whimsy of the umbrella light, we gave character to a kitchen that could have had a sterile look,” says Foreman. 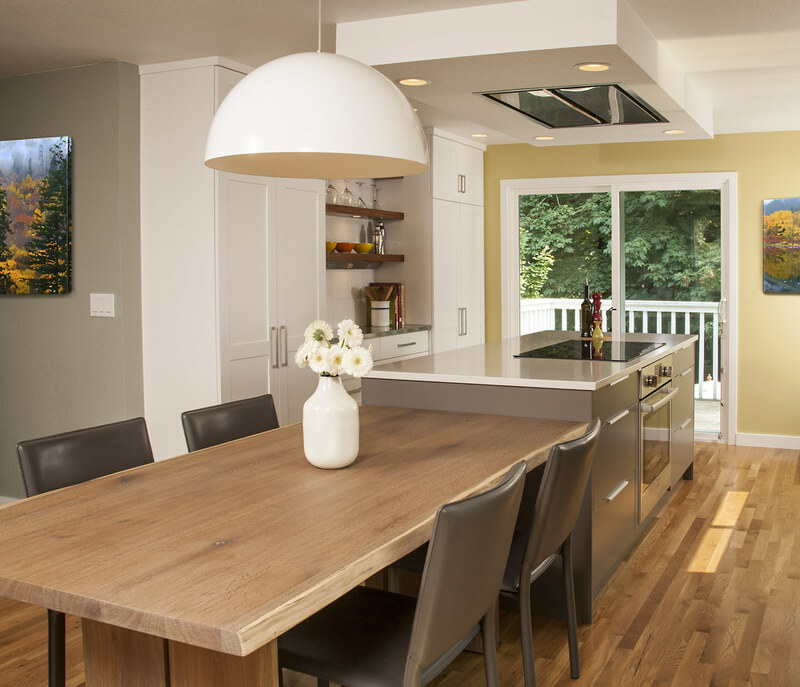 Everyone has their idea of a dream kitchen, and these clients were no different. With over 20 years to think about it, the clients brought the Neil Kelly team a very clear direction. The open, spacious feel they were looking for was achieved by removing an existing structural wall. More counter and storage space was created by being mindful of areas like the work triangle and sliding glass doors, and making the most of the space created by the larger island. Ready to make your dream kitchen into a reality? From helping you work out the details to putting together a complete redesign from scratch, we can help. Get in touch with Neil Kelly today. 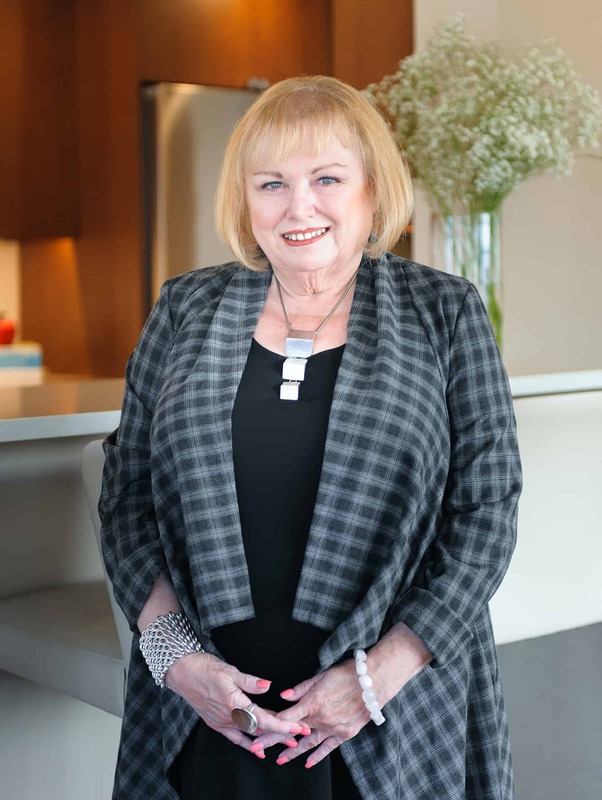 To say Diane Foreman is a Certified Kitchen and Bath Designer is an under-statement. The remodeling industry continually honors her work. 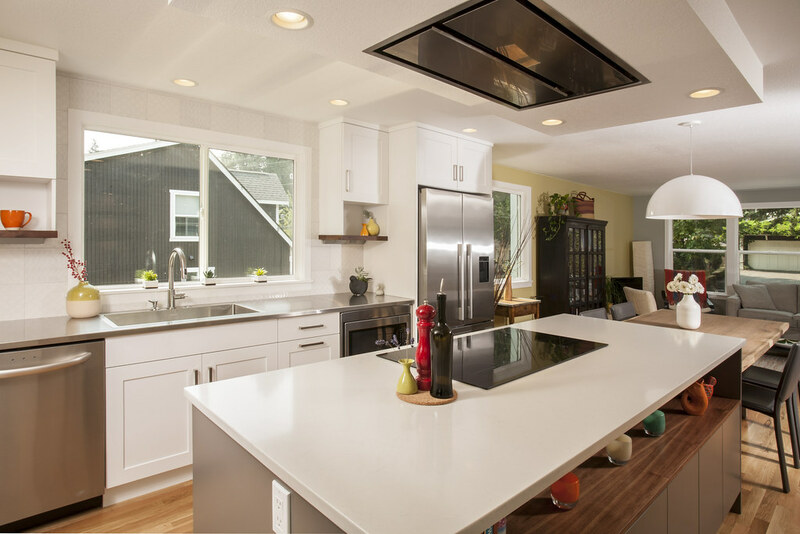 She won the National Kitchen and Bath Association’s “Overall Best in Competition for the US and Canada” Award, as well as a NKBA national award in their kitchen category. Her clients weren’t the only ones impressed by her Queen Anne condo kitchen remodel: Diane won a NARI Regional Coty Award and an HBA Remodeling Excellence Award for the project. View Diane’s Houzz portfolio and read client reviews.